The town of Aguas Calientes or Machu Picchu Pueblo, it is located 112 km. from City of Cusco (4 hours by train), 15 km. from the City of Machu Picchu (25 minutes by bus) that is located about 2,400 m.a.s.l. This town is the arrival point for trains from Cusco to Machu Picchu and takes the name of "Aguas Calientes" by the existence of medicinal mineral springs located 10 minutes from town, the same that have been prepared for tourist use and which are attended hundreds of travelers to recover energy after making long walks. The village has a Main Plaza, where there is a small church and the Municipality of the place, also has a craft market and two museums and from this town, leading to different hikes that lead deep into the mountain. 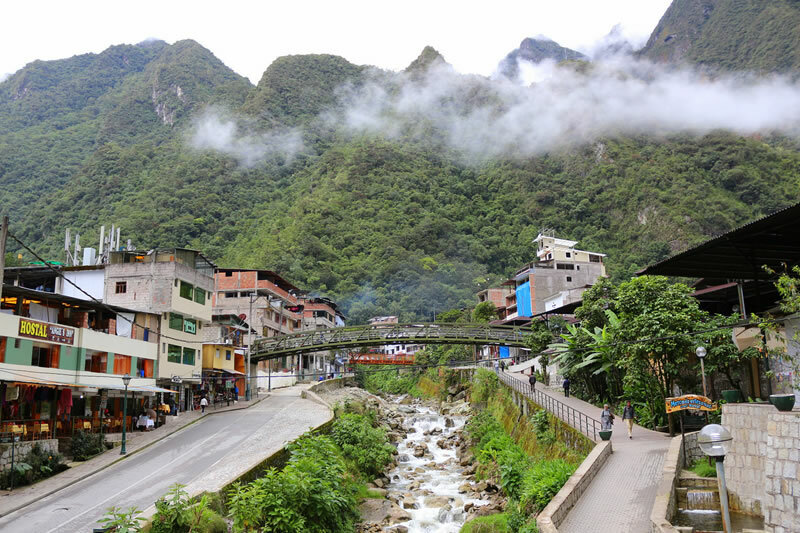 Undoubtedly, the Town of Aguas Calientes is a cozy place with a lot of movement of tourists, who focus on the few streets of the place and fill the restaurants, bars, pizzerias and pubs, where you can taste all kinds of typical food and international. You can find restaurants of different categories, from the cheapest to the most exclusive. The hotel offer is also varied you can find hostels, hotels, cabins outside the village; All at different prices from PEN S / 20.00 to USD $ 600.00 approximately, prices that vary according to the category and location of the accommodation. In the town of Aguas Calientes there are all kinds of accommodation. From a municipal camping which costs PEN S/. 20.00 per tent; up to 5-star hotels of USD $ 600.00. The offer, hotel is extensive and can make reservations online. All hostels and hotels are very characteristic for its decoration, they are made with very good taste and own arrangements in the area, wood furniture handmade from any large or small window you can see the beautiful scenery of the mountains of Machu Picchu. Certainly also you find hotels with westernized decor. Like the hotels, in the town of Aguas Calientes there are restaurants of different categories. You can find cheap restaurants as well as exclusive restaurants, all you serve local and international food. You can always find something that fits your taste and budget. In Aguas Calientes there are some bars. Most of these offer beverages with promotions. The prices are a little higher than you can find in the City of Cusco. Many of the bars in the city offer pisco sour, the Peruvian flag drink prepared with Peruvian pisco. Most bars in the city can be found on Avenida Pachacutec. If you are one of those who enjoy the drinks outdoors, you may find some bars located on a second floor with open terrace. Make a hike to Mandor Waterfall is a quiet walk is 4 km. from town. Another option is to go to the Hot Springs of Aguas Calientes is a place that has pools, dressing rooms and a snack bar. You can visit the Museo de Sitio Manuel Chavez Ballon where you have a panorama of the discovery and investigation of Machu Picchu. There is also the Museum of Models of the Municipality of Machu Picchu. And if you have good physical condition, experience in trekking, climbing high level, you can encourage you to ascend to the Putucusi Mountain. Get more information about the tourist sights in Aguas Calientes or Machu Picchu Pueblo.